The College of Education and Human Sciences prepares knowledgeable practicing professionals by "engaging learners, inspiring leaders, and transforming lives". 1. The candidate demonstrates commitment to professional responsibility. 2. The candidate demonstrates commitment to ethical standards. 3. The candidate demonstrates a commitment to continually evaluate his/her practice to meet the needs of all learners. 4. The candidate demonstrates a commitment to using current technology for improving student learning and enriching professional practice. 5. The candidate demonstrates a commitment to deepening his/her understanding of cultural, ethical, gender, and learning differences with the goal of building stronger relationships and creating more relevant learning experiences. 6. The candidate demonstrates commitment to collaborate with learners, families, colleagues, other professionals, and community members in order to ensure learner growth and advance the profession. Refer to the Forms, Policies, and Procedures tab to access the Disposition Referral Form and Procedures. Know and use self-awareness and reflection as decision-making tools for assuring student learning, professional performance and personal growth. 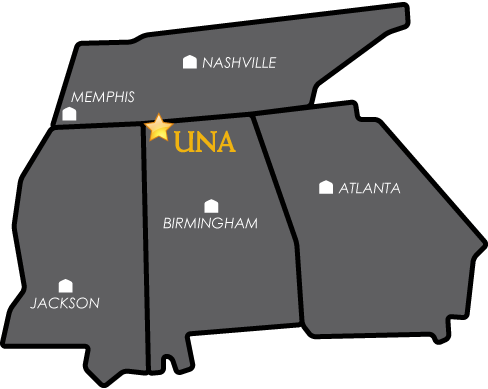 Graduates of the University of North Alabama's College of Education & Human Sciences are knowledgeable practicing professionals who are prepared as outstanding educators and leaders through achievement of the highest standards of knowledge and practice to assist all students to learn. Click here for a printable version of the completed Conceptual Framework Commitments.